A visitor to Uganda will speedily grasp that chicken is the go-to bite in any part of the country. On small chalkboard menus hanging on the walls of roadside restaurants along the backstreets of Kampala, the words “TV Chicken” are written in bold letters. If your chicken was made any other way, it does not deserve to be awarded the “TV Chicken” title. When it’s finished cooking, the bird should have an inviting golden-brown hue and succulent flavor. It’s usually served in large portions with French fries, smoked bananas or cassava, and a variety of salads. As evening begins, you'll find a large number of TV chicken vendors appearing on the streets next to pubs to offer a pre-drinking dinner or a late-night snack. 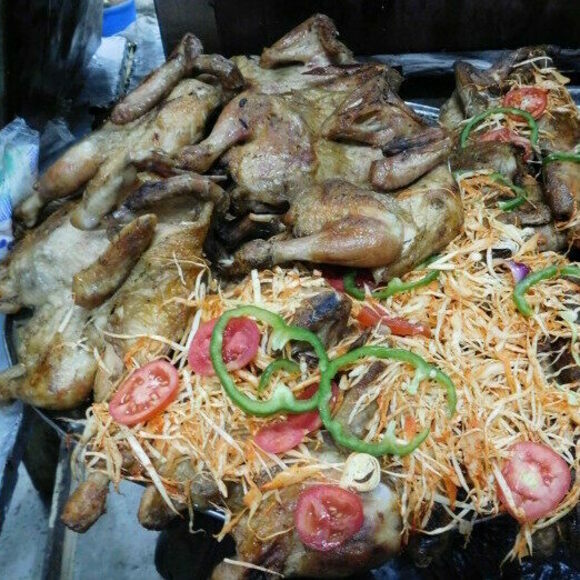 The hub for TV chicken in Kampala boasts multiple vendors specializing in the dish. The market is located next to the Wandegeya Roundabout. Another great spot for watching and eating TV chicken. You might not even see the meat beneath this pile of potato chips, sauce, and quail eggs.